2.5 Rod an Main Bearing??? Adjusting TPS on a 4.0 Renix w/AW4. D35 vs. D44 drums, brake parts interchage? 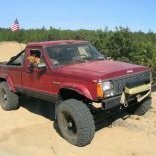 Larger tires with no lift? Got my new tires and wheels installed..